Summary: Where do teachers newer to the profession fit into the NWP equation? How do we help new teachers survive and thrive in the early years of their careers? If you are grappling with how to engage early career educators in your site’s programs, this report on NWP’s New Teacher Initiative can serve as a catalyst for dialogue about the purpose of engaging new teachers and the practices you might want to put into place. 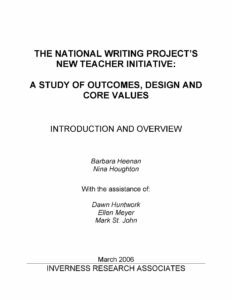 The report, which describes the work of eighteen NWP sites engaged in programming for new educators, is conveniently broken down into four smaller, focused module reports on programming: 1) the benefits to new teachers of participating, 2) the emerging practices, 3) the distinctive design features across sites, and 4) NWP core values embedded in the programs. The entire report will be useful for site leaders beginning to consider programming for newer teachers, while those already offering new teacher programs may find themselves gravitating towards one of the four modules. In our view the major outcomes of the New Teacher Initiative are the range of benefits accrued by new teachers as the result of their participation in NTI programs. The outcomes or benefits are, in turn, the product of a set of three cascading dimensions of capacity that both pre-existed and shaped the NTI, but also expanded and evolved as a result of the NTI efforts. In other words, these capacities serve as the foundation that underlies the work that produces the outcomes. First, we see that the benefits to new teachers are the direct results of common activities, strategies and practices that emerged at the NTI sites as the initiative progressed. This first layer of foundational capacity is that of effective practices used in appropriate ways at appropriate times. In turn, those practices are derived from and represent key designs and design principles we found appearing throughout the professional offerings “invented” by the NTIs. Thus the second layer in the foundation is the defining presence of design principles that help shape the ways in which actual practices are created and implemented. Finally, continuing on down the causal chain, the NTI designs and their key features derive from a bed rock of shared values and beliefs that are indigenous to the National Writing Project. At the same time the NWP has honed over many years a well-developed infrastructure to support sites and individuals in the realization of those values. The third layer in the foundation then is a kind of cultural capacity – the underlying culture, consisting of core values and supporting infrastructure for enacting the NWP values.